Over a seven-day period in November 2014 the University of Melbourne joined with the Suanum community to build a neonatal and composting toilet facility. The neonatal building sleeps four with a separate consultation room next door. 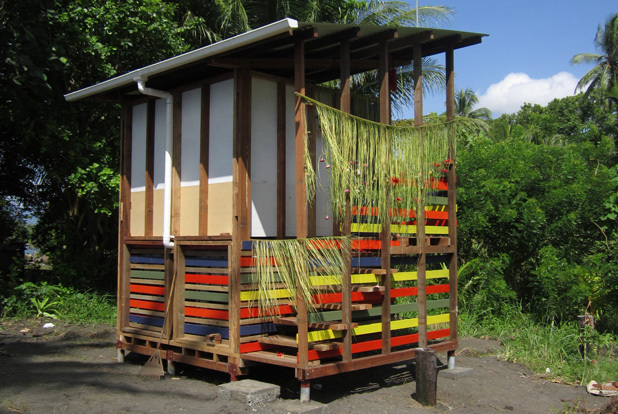 The composting toilet was similar to those constructed by Bower Studio at the Sipaia community in 2012. Perinatal complications are the leading form of mortality in Papua New Guinea and are responsible for greater numbers of deaths than pneumonia and malaria. Maternal mortality rates are more than 100 times greater in PNG than Australia and infant mortality rates are more than 10 times as high. Like all coastal communities in PNG, Suanum is at risk from rising sea levels. The low lying community is under threat and the traditional pit toilets flood during high tides spreading human waste throughout the community. The new four-bed neonatal center with a room for storing medication and ablutions facility responds to these risks by providing a healthier place for infants and mothers at the most vulnerable time of their lives and a space where women’s health issues are addressed in a culturally appropriate manner. The facilities are lit with solar lights at night and are locally managed in such a way as to ensure that the overall project remains sustainable over the long-term. Regardless of age and gender the broader Suanum community contributed to the high levels of local interest and labour. The younger men saw the construction techniques, particularly the use of power tools, as a great opportunity to increase their skills base and capacity to obtain paid employment in town. Bower Studio thanks the people of Suanum for welcoming the team into their community and hosting us during our visit.